Marth is the main protagonist of Fire Emblem: Shadow Dragon and the Blade of Light and its sequel, Fire Emblem: Mystery of the Emblem. He is the prince of Altea and the wielder of the legendary Falchion. He is one of the playable characters from the Fire Emblem series to appear in the Super Smash Bros. series, along with Roy, Ike, Robin, Lucina, Corrin, and Chrom. Enters the stage via warp magic. 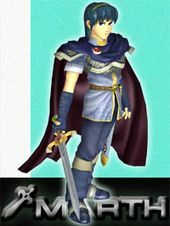 Marth first appears in the Super Smash Bros. series in Super Smash Bros. Melee as an unlockable character. His design in this title is based upon the one used in Fire Emblem: Mystery of the Emblem. While Marth was a heavily-requested character in Japan, he and his series were unknown to Western audiences before Super Smash Bros. Melee. As such, he and Roy were originally planned to be Japan-exclusive characters, but were included in international versions due to insistence from Nintendo of America, helping to introduce Fire Emblem to the West. Marth can be unlocked by playing as every default character in a Melee match, clearing or failing Classic with all of the default characters, or by playing 400 Melee matches, and then defeating Marth when he challenges the player. Reflecting the series' Japan-only status at the time, Marth keeps his Japanese voice clips in all versions of the game; Marth is voiced by Hikaru Midorikawa, reprising his role from the Japanese release of the Fire Emblem: Mystery of the Emblem OVA. Marth's design in this game is based upon his appearance in the game Fire Emblem: Mystery of the Emblem. Marth is a fast, average power character of below-average weight. However, all of his attacks are stronger when hitting opponents closer to the tip of his sword. His standard special is Shield Breaker, a slash that can be charged to be more powerful that can also instantly break an opponent's shield when charged fully. His side special is Dancing Blade, a series of sword slashes that can be altered depending on the direction inputted on the control stick. His up special is Dolphin Slash, an upward slash that has Marth leaping into the air. Finally, his down special is Counter, in which Marth delivers a counterattack when hit. 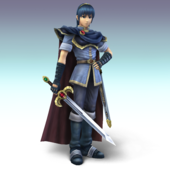 Marth also appears in Super Smash Bros. Brawl, alongside fellow Fire Emblem character Ike. He is unlocked by either playing 10 Brawl matches, clearing Classic Mode on any difficulty, or by meeting him in The Subspace Emissary. For the first two methods, he will be fought afterwards, and must be defeated to be unlocked. Although Marth's moveset is unchanged, his Shield Breaker has been changed to a move in which he thrusts his sword. He is also given a Final Smash: Critical Hit, a single powerful hit that deals fatal knockback to whoever it hits. In addition, the sweetspot on his sword has been made smaller, and his grab has a shorter range. Marth is seen standing over a castle watching down at the desert. Marth sees the Subspace Bomb exploding in the distance and creating a large hole in space that remains in the middle of the desert. Marth takes out his sword and walks over to it to inspect it, while defeating some Primids along the way. He finally is in front of the hole in space. Suddenly, Meta Knight comes out of the sky and attacks Marth, thinking that he is an enemy. The two fight, until abruptly, Primids are sent out. Marth and Meta Knight both cut the Primids in half. Marth and Meta Knight look at each other surprised and realize that they are in the same team. Primids keep emerging as the two stand back to back seeing them grow. They then charge at the Primids and attack them. Later, Ike gets to join the party by managing to take a Subspace Bomb away from the Ancient Minister. The three warriors chase him until he manages to get away. Later, Marth and the others discover a strange tank in the middle of The Wilds. After a bit of hesitation, Marth follows the others to the tank, which then reveals itself to be Galleom. After Galleom's initial defeat, it tries to get away, but ends up falling into The Ruined Hall. It eventually emerges carrying Lucas and the Pokémon Trainer into a sky while detonating a Subspace Bomb. While Lucas manages to free himself and the Pokémon Trainer from Galleom's grasp, they are rescued from a fall by Meta Knight, and thus tag along with Marth's team as well. Marth and his companions eventually arrive at the foot of the Glacial Peak, finding Meta Knight's ship, the Halberd, attacking the Great Fox. Meta Knight leaves Marth's team to scale the mountain in an attempt to board the Halberd. After a while, the Ice Climbers fall to where Marth and his team are, and are faced with more Primids until Mario, Link, Yoshi, Kirby, and Pit intervene. Eventually, every character comes together to track down the evil source at Subspace, discovering Tabuu as the one behind the Subspace Army. Everyone, including Marth, gets hit by Tabuu's Off Waves and turned into trophies. However, King Dedede had foreseen this happening, and created badges that revive whoever was wearing them. Reviving Luigi and Ness this way, King Dedede heads off with his companions to rescue a majority of the others, Marth included, before settling the score on Tabuu. 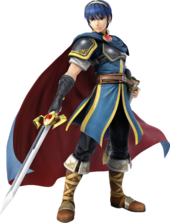 Marth is also a playable fighter in Super Smash Bros. for Nintendo 3DS and Super Smash Bros. for Wii U. He is one of the several unlockable characters from Super Smash Bros. Brawl who was made a starting character for these games, with the others being Luigi, Toon Link, Lucario, Sonic, Captain Falcon, Ness (Wii U version only), Ganondorf (Wii U version only), and Jigglypuff (Wii U version only). 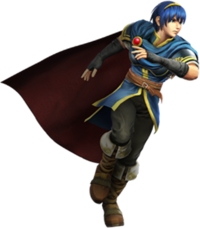 Marth's appearance has been updated, incorporating elements from Fire Emblem: Shadow Dragon and later games. Aside from this, his moveset is unchanged from the previous game, though most of his sword swinging attacks now feature a trail that glows brighter at the end to make the sweetspot more visible. Another Fire Emblem character, Lucina, shares a similar moveset with Marth. Marth returns as an unlockable playable character in Super Smash Bros. Ultimate, as with all previous characters. 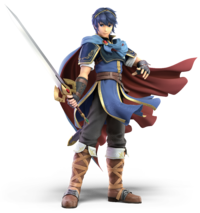 Unlike the previous Super Smash Bros. games, Marth is voiced in English; Yuri Lowenthal voiced Marth in a few of the dubbed Fire Emblem games, and reprises his role as Marth's English voice actor. His voice actor in the previous games, Hikaru Midorikawa, continues voicing Marth exclusively in the Japanese version of the game. Marth benefits from universal changes: he sports faster mobility, his short hop timing is reduced, his aerials have less landing lag, he can directionally air dodge once again, and he can use any ground attack out of a run and any aerial attack on a ladder. Marth's Classic Mode route involves him fighting reptilian opponents, representing his final quest to slay an Earth Dragon in Shadow Dragon and the Blade of Light. Shield Breaker is Marth's standard special move, based upon the Rapier's ability to deal extra damage to armored enemies in the Fire Emblem series. By holding the special button, Marth charges up an attack with his sword that deals high damage and, as the name states, is capable of breaking opponents' shields at full charge. In addition, unlike most charge attacks, Marth automatically unleashes the attack when fully charged, rather than saving the attack for later, and can also be automatically performed by releasing the special button at any point during charging. In Super Smash Bros. Melee, the Shield Breaker has Marth holding his sword over his shoulders to charge and releasing it as a vertically arcing slash. As of Super Smash Bros. Brawl, however, the attack was changed to a forward thrust, decreasing its range, though it is also faster to charge and execute; the move's power was also decreased for Super Smash Bros. Brawl but was increased again for Super Smash Bros. for Nintendo 3DS / Wii U. Also starting with Super Smash Bros. Brawl, Marth can turn around while charging by tilting the control stick in the opposite direction soon after starting to charge the attack, though unlike most moves this does not increase the move's damage output. In Super Smash Bros. for Nintendo 3DS / Wii U, the Shield Breaker's first custom variant is Storm Thrust, which deals less damage than the normal Shield Breaker but creates a gust of wind that blows opponents away, the size of the gust also depending on how much the attack is charged. 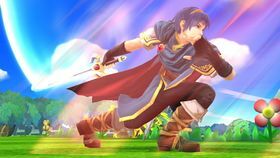 The second custom variant is Dashing Assault, which like Storm Thrust does not deal as much damage as normal, but Marth charges forward when attacking, allowing him to strike multiple opponents more easily; the distance he moves forward is also determined by how much the attack is charged. Dancing Blade is Marth's side special move. 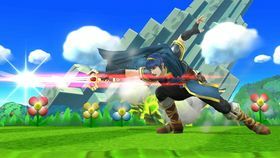 When used, Marth deals a sword slash combo that can be executed by pressing the special move button; the full combo consists of four hits. In addition, certain portions of the attack also differ depending on the direction the player tilts on the control stick; the second hit has an up and forward variation, and the third and fourth have up, down, and forward variants. The third and fourth slashes deal higher knockback and damage, and Marth's down third attack acts as a meteor smash. The move is faster and easier to execute in succession in Super Smash Bros. Ultimate. In Super Smash Bros. Melee, Marth's entire body glows a certain color depending on the direction inputted on the analog stick for each part of the attack; in Super Smash Bros. Brawl and Super Smash Bros. for Nintendo 3DS / Wii U, however, only the trails of Marth's sword glows. In Super Smash Bros. for Nintendo 3DS / Wii U, the Dancing Blade's first custom variant is Effortless Blade, which does not have the directional inputs for each attack and does not deal as much damage, but the input window between each attack has been increased. The second variant, Heavy Blade, increases the duration of each strike as well as giving each one greater attack and launch power, though this makes it harder to combo. Dolphin Slash is Marth's up special move. 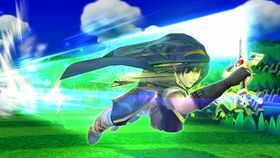 Marth quickly leaps up into the air slashing his sword directly up, damaging any nearby opponents. The attack deals the most damage at the beginning. In Super Smash Bros. for Nintendo 3DS / Wii U, the Dolphin Slash's first custom variant is Crescent Slash, which gives more horizontal distance at the cost of jump height, and deals the most damage at the midpoint of the attack. The second variant, Dolphin Jump, increases the move's jump height, but does not damage opponents. Counter is the down special move used by Marth as well as Roy, Ike, Lucina, and Chrom. The move is based on the combat of the Fire Emblem series; when one unit attacks another unit, the opposing unit counterattacks afterwards. When used, Marth enters a readied stance and automatically counterattacks whenever attacked, reflecting all damage and knockback back onto the opponent. In Super Smash Bros. Melee, compared to Roy's Counter, Marth's is faster and lasts longer, but only deals a set 7% damage no matter the attack. In Super Smash Bros. Brawl and Super Smash Bros. for Nintendo 3DS / Wii U, however, Marth's Counter deals 1.1 times the damage of the opponent's attack. In Super Smash Bros. for Nintendo 3DS / Wii U, the first custom variant for Marth's Counter is Easy Counter, which has a longer window for counterattacking but deals less damage. The second variant is Iai Counter (known as Rush Counter in the PAL release), which deals a faster attack that sends the opponent flying behind the player, but does not deal as much damage. 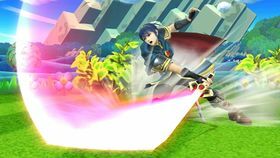 Critical Hit is the Final Smash used by Marth as well as Lucina and Roy, based upon the critical hit mechanic of the Fire Emblem series. After breaking a Smash Ball and activating it, Marth charges directly forward, striking any opponents in his path and dealing high damage and knockback. In most cases, it results in a one-hit KO. A health bar in the style of the Fire Emblem games also appears for each character struck by the attack that completely depletes; in Super Smash Bros. Brawl it is designed after the ones in Fire Emblem: Mystery of the Emblem, while in Super Smash Bros. for Nintendo 3DS / Wii U, it is based on the health bars in Fire Emblem Awakening. 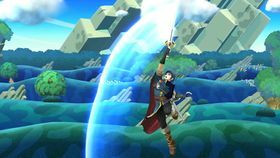 When used on the ground, Marth charges to the end of the platform on which he is standing. When used in the air in Super Smash Bros. Brawl, however, Marth does not stop charging unless he hits an opponent, meaning that he can fly off the screen, though in Super Smash Bros. for Nintendo 3DS / Wii U, Marth only moves a certain distance forward before the Final Smash automatically ends. In both games, the player can also press either attack button to execute the sword slash at any point while flying forward, ending the attack then. Marth appears as a playable character in Super Mario Maker, as one of the Mystery Suits that are part of Costume Mario. He can be unlocked via amiibo, or as a randomly unlocked costume by clearing 100 Mario Challenge on Normal difficulty or higher. Marth's sprite in this game uses the basic structure of the Small Mario sprite while designed after his Super Smash Bros. for Nintendo 3DS / Wii U appearance and uses sound effects taken from the original Fire Emblem: Shadow Dragon and the Blade of Light. Classic The betrayed prince of the Kingdom of Altea, the blood of the hero Anri flows in Marth's veins. He was forced into exile when the kingdom of Dolua invaded Altea. Then, wielding his divine sword Falchion, he led a revolt and defeated the dark dragon Medeus. Afterwards, Altea was annihilated by King Hardin of Akanea. Adventure Marth is a magnificent swordsman. While his swordplay is faster than that of Link, he lacks power, and his quickness if offset by a marginal endurance. His Shield Breaker gains power the longer it's held. The Dancing Blade combination uses both the Control Stick and the B Button to produce a series of up to four attacks. All-Star The tip of Marth's blade causes the most damage, so you should try to create adequate distance between you and your enemy to gracefully strike with that point. Marth's dolphin Slash is fast and powerful, but it leaves him vulnerable upon landing. Marth uses Counter to block a foe's attack and deal a return strike. If you're fighting a Counter-happy Marth, grab him. Marth The prince of Altea, in whose veins the blood of heroes runs. He and a small group of stalwarts fought to free Altea after it was invaded by the kingdom of Doluna and the dark dragon, Medeus. With his divine sword, Falchion, he fought and defeated Medeus. However, Altea was then invaded by King Hardin of Akaneia and eventually destroyed. Mei Ling: Snake, have you heard the saying "Politics makes strange bedfellows"? Snake: Don't tell me that's a Chinese proverb. Mei Ling: Err, no... It means that when the going gets tough, you might need unexpected partnerships in order to succeed. Marth was a prince whose kingdom was usurped. He didn't even have an army to fight with him. But as he battled his way forward, he found new allies to fight at his side, and in the end, he was able to reunite the war-torn land of Altea. Super Famicom Fire Emblem: Mystery of the Emblem (Japan) NA: The first hero from the Fire Emblem series, Marth is the prince of Altea and descendant of the hero Anri. In Smash Bros., he's known as an exceptional swordfighter, swinging his blade with grace. Striking with the tip will maximize the damage dealt. Teach aggressive foes a lesson with his strong Counter move. PAL: Marth, the prince of Altea, is the hero of the first ever Fire Emblem game and its remake, Fire Emblem: Shadow Dragon. In this game, his graceful sword skills are what set him apart. Strike with the tip of his blade to deal extra damage, and use his Counter skill to defend yourself, no matter which directions you're being attacked from. Super Famicom Fire Emblem: Mystery of the Emblem (Japan) NA: Marth's side special Dancing Blade is a four-stage attack. Aim and time your strikes carefully! The tip of his sword does the most damage. For his up smash, Justice Sword, he thrusts his blade into the air. You can use it to block attacks from above and launch nearby foes. PAL: Marth's side special, Dancing Blade, is a four-stage attack. Aim and time your strikes carefully! As usual, the tip of his sword does the most damage. For his up smash, Justice Sword, he thrusts his blade into the air. You can use it to block attacks from above, and even to launch nearby enemies off the ground. Pit: Get a load of Mr. Fancy Pants here. Viridi: Is that jealousy I detect in your voice, Pit? Pit: Why would I be jealous of Marth? Palutena: Anyway, Prince Marth's most dangerous attack comes from the tip of his sword. Avoid his blade when you're at midrange. Pit: So I should either attack him from a distance, or get up close and personal. Palutena: He's got a counter as well, so be on guard when you go hand to hand. If you're attacking from afar, use items to improve your chances. "I cannot afford to lose!" "I win to fight again!" Marusu Possibly "Mars", but officially "Marth". See: Marth's etymology. Mars From the Japanese name. Marth is the only character in Super Smash Bros. Brawl whose back is turned at the camera when he faces right and his front faces the camera when he faces left. All other characters do the opposite. This is perhaps in reference to how the player characters are oriented in the first eight games of the Fire Emblem series, with the players on the right side of the screen facing left during the normal fight scenes. This page was last edited on April 12, 2019, at 13:53.